There are so many pills and potions out there claiming to give us luscious flowing locks and amazing weight loss results by just taking one pill a day but how many of these actually work? Well a couple of weeks ago, TN Health were looking for volunteers to test out their new product, Hairworx and of course like probably any beauty blogger would, I jumped at the chance to be a part of this. After several years of bleaching my hair to create my Ombre look, it had really started to take it's toll on my hair. Tonnes of conditioner was needed and leave-in products were a necessity when washing my hair and let's not even talk about split ends and breakage! Uhh! Last year I tried Tesco's own brand hair, skin and nail capsules (post here) and although I could notice a difference to my both my hair and nails, I had to stop taking them as they were giving me very painful stomach cramps. 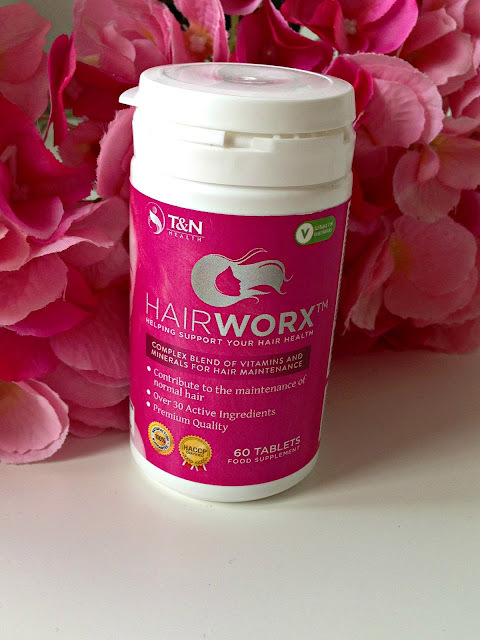 Obviously this had made me slightly nervous to take the Hairworx tablets but I thought I would put my bad experience behind and give a fair chance. At first when I received the capsules I wasn't too sure what to expect. As I said above, I've used hair vitamins before and the side effects from them had made me a little scared that these Hair Worx capsules would do the same. Fortunately for me they didn't and I've been taking them for around one month now. At first I wasn't noticing much difference but after probably the second week I was starting to see that my hair was a lot thicker and easier to manage after washing. Instead of smothering my hair with conditioner and leave-in creams and sprays, all I use now is a normal amount of conditioner and that's it. No leave-in products AT ALL! How amazing?! One month on and I can't imagine my life without them. Dramatic I know. My hair has never felt so soft and my nails are actually starting to grow without breaking right at the bottom. As I've tried to picture above, my hair is so much thicker! Overall I am super impressed with these capsules and I definitely will be continuing them when this pack has ran out! If you're interested in treating your gorgeous locks, you can check the capsules out for yourself here on Amazon!